Turkey's Foreign Minister Ahmet Davutoglu says Ankara won’t allow Syria to use the outlawed Kurdistan Workers’ Party (PKK) against his country. “Turkish security forces are monitoring a number of PKK groups entering Turkey from Syria. Turkey would not allow any country to undermine its security,” Davutoglu said on his way to Nakhchivan City, capital of the Nakhchivan Autonomous Republic of Azerbaijan, after talks with his Dutch counterpart, Uri Rosenthal, in Rotterdam on Wednesday. A think piece by Oytun Orhan, published last month in the Turkish daily Today's Zaman, says the first signal of cooperation between Syria and the PKK emerged from a recent news analysis by Firat News Agency, which is close to the PKK. The analysis said Turkey's ill-advised policies led Syria and Iran to give anti-Turkish forces "freedom of movement" against Ankara. The PKK's sidekick in Syria, the Democratic Union Party (PYD), always refers to Syrian-Kurd representatives in the SNC as "collaborators." PYD leader Saleh Muhammad was meantime allowed back to Syria from exile and co-opted to become deputy chairman of the National Coordination Committee for Democratic Change, which supports reform in Syria but does not advocate dismantlement of the Syrian dictatorship and the removal of Bashar al-Assad as president. 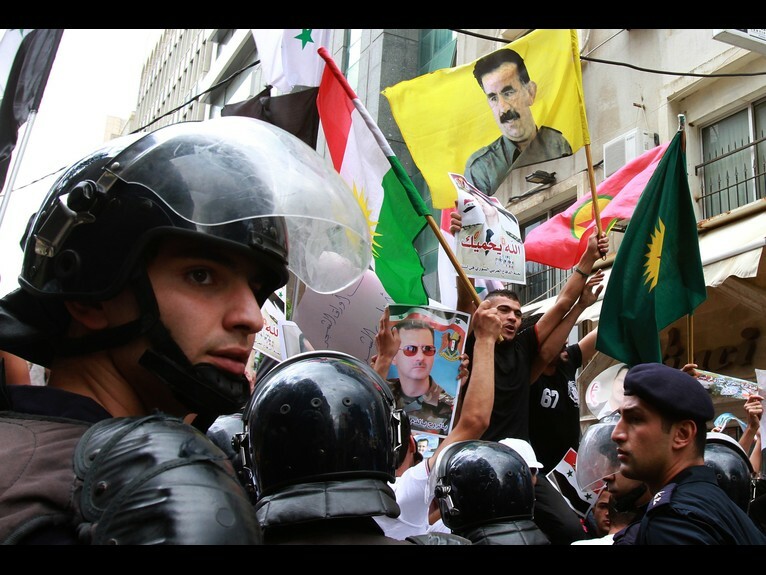 Another signal of the Syria-PKK rapprochement came from the Lebanese capital within weeks of Tammo's assassination. PKK flags and posters of Abdullah Ocalan were unfurled during a pro-Assad demonstration organized in front of the Syrian embassy in Beirut on October 31. In November, Syria allowed the PKK to set up a camp for 150 of its men a short distance away from Sanliurfa in southeast Turkey. The commander of the new PKK camp is believed to be Fehman Huseyin of Syria, who goes by the codename Bahoz Erdal and masterminded PKK attacks in Turkey, including the Çukurca outrage last October, when 26 Turkish soldiers were killed.